152 mm/53 Mk162 х 2 / 8 х 1 pcs. Initial AP Shell Velocity914 m./s. 76.2 mm/50 Mk22 mod. 24 х 1 pcs. 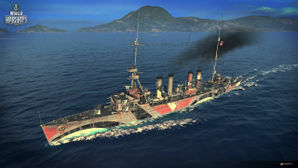 Marblehead Lima — American promo premium Tier V cruiser. A high-speed scout cruiser with powerful torpedoes and artillery. Carried aircraft handling equipment. She was unlike other ships of her class in terms of the placement of her main guns. This re-skinned version of Marblehead used to be available exclusively as an invite code sold along with certain ASUS motherboards and graphics cards. Later, she was offered for regular purchase. Marblehead is a variant of the American Tier V cruiser Omaha. When the two ships are put side-by-side, Marblehead has the most in common with Omaha’s (B) hull, with the gun and firing control upgrades. As such, it has eight guns. In addition, the AA remains the same as on Omaha’s (A) hull, which means it's all but non-existent. However, it does come with a catapult fighter, which can be launched to intercept incoming bombers and can make up for the small amount of AA if used wisely. Unfortunately, it does not have the lower torpedo launchers of Omaha, and Marblehead’s launchers use different torpedoes with completely different specifications. As a result, the play style when using torpedoes is quite different. To begin with, the salvo has fewer torpedoes as the hull is left with two triple-tube launchers instead of four. While they have an impressive range of 8.2 km, making them more useful for flooding or weakening BBs, they cannot be relied upon to sink an enemy at range due to poor speed of only 49 knots, making each salvo easier to evade. Furthermore, the low damage is painful if attempting to kill a single target, as each inflicts only 6233 damage max. However, at close range or against multiple targets, the torpedoes do have a fast reload time of 38 seconds compared to Murmansk’s 69 seconds and Omaha’s 44. Very rapid firing weapons, and lots of them. Torpedoes have the range to harass enemy battleships. Carries a catapult fighter to supplement AA defenses. Weak armor makes it susceptible to citadel penetrations from the enemy. Large detection range and poor AA. Torpedoes have low damage and are easy to avoid (especially at long range). Inferior to Murmansk in every aspect. As a premium ship, Marblehead Lima doesn't have any upgrades to research. Installing upgrades like Main Armaments Modification 1 ( ) to keep the guns active, and Aiming Systems Modification 1 ( ) to improve her accuracy, will help Marblehead’s overall effectiveness. As a premium ship, Marblehead Lima comes included with Type 9 camouflage that lowers her detection radius, reduces the accuracy of incoming shells, and increases the amount of experience she earns. USS Marblehead (CL-12) was an Omaha class light cruiser of the United States Navy. She was the third Navy ship named for the town of Marblehead, Massachusetts. Marblehead was laid down on 4 August 1920 by William Cramp and Sons, Philadelphia; launched on 9 October 1923. sponsored by Mrs. Joseph Evans; and commissioned on 8 September 1924, Captain Chauncey Shackford in command. This page was last modified on 12 September 2018, at 09:16. This page has been accessed 17,256 times.